Reports of Moore's Law's demise have been greatly exaggerated. In its opening Developers Forum keynote presentation at San Francisco's Moscone West Center today, Intel unveiled its newest class of minuscule Quark processors. And at 14nm, the Quark could well make most any device smarter. As Intel CEO, Brian Krzanich, and President, Renee James, explained to the packed auditorium, the pace of processor innovation today exceeds every effort in the past four decades. Specifically, as mobile devices have become commonplace, the need for smaller, lighter, faster, and better performing components has driven the industry away from conventional CPUs to more balanced System on a Chip (SoC) architecture. It's also leading to, what Krzanich describes as, "the Internet of Things": truly ubiquitous computing platforms integrated into our daily lives. And he expects the new line of Quark SoCs to play a major role in that development. The Quark line of SoC, such such as the x1000 model he demo'd on stage is reportedly a fifth the size of the current Intel Atom and consumes just 10 percent of the power while boosting performance by over 30 percent. "It's the smallest thing we've ever built," said James. The Quarks are expected to begin shipping next year. What's more, Krzanich took the opportunity to show off the company's 22nm SoC phone platform in the form of the Lenovo k900. This chip offers a 50-percent performance gain (2GHz processor—equivalent to a top-of-the-line desktop just two years ago), better battery life (12 hours talking, 12 days standby) and, finally, offers LTE capabilities. While the chip only achieves LTE speeds over voice presently, Krzanich is confident that it will feature true LTE (data and voice) by the end of the year with data through-puts reaching 150MBPS by early next year. In addition, Krzanich also hinted at 10nm SoC's becoming available by 2015 and single digit lengths by 2017, though there's no guarantee we will. 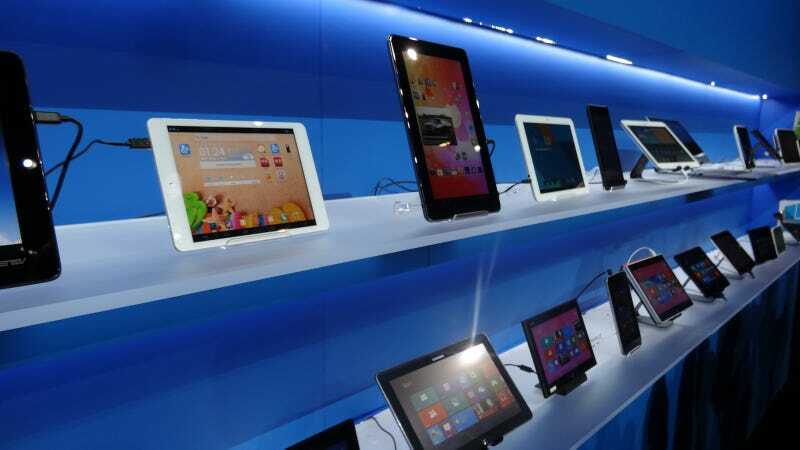 What we can expect to see, according to the Intel CEO, is more than 60 models of sub-$100 tablets and 2-in-1's powered by Intel processors on store shelves by this holiday season. This lineup will include Android and Windows platforms running Atom and Core processors alike. It's looking a lot like Christmas already.